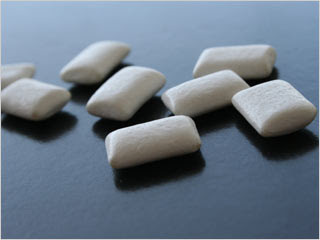 Chew gum, lose weight ~ Health Matters Today! Most people understand that serious weight loss requires changing attitudes toward what they eat and how often they exercise. But, what if the process could be aided by simply chewing a stick of gum after meals? That's the question a team of scientists, led by Syracuse University chemist Robert Doyle, is trying to answer. In a groundbreaking new study, Doyle's team demonstrated, for the first time, that a critical hormone that helps people feel "full" after eating can be delivered into the bloodstream orally. Doyle's study was published online Nov. 4, 2011 in the American Chemical Society's Journal of Medicinal Chemistry and is forthcoming in print. The journal is the most cited in the field and one of the leading primary research journals internationally. Doyle is an associate professor in the Department of Chemistry in SU's College of Arts and Sciences. He collaborated on the study with researchers from Murdoch University in Australia. The hormone, called human PYY, is part of a chemical system that regulates appetite and energy. When people eat or exercise, PYY is released into the bloodstream. The amount of PYY that is released increases with the number of calories that are consumed. Past studies have shown that people who are obese have lower concentrations of PYY in their bloodstream both when fasting and after eating than their non-obese counterparts. Additionally, intravenous infusion of PYY into a volunteer group of obese and non-obese individuals increased the serum levels of the hormone and lowered the number of calories both groups consumed. "PYY is an appetite-suppressing hormone," Doyle says. "But, when taken orally, the hormone is destroyed in the stomach and that which isn't destroyed has difficulty crossing into the bloodstream through the intestines." What's needed is a way to disguise the PYY so that it can travel through the digestive system relatively unharmed. Several years ago, Doyle developed a way to use vitamin B12 as a vehicle for the oral delivery of the hormone insulin. B12 is able to pass through the digestive system with relative ease and carry with it insulin, or other substances, into the bloodstream. Similarly, his research team attached the PYY hormone to his patent-pending vitamin B12 system. "Phase one of this study was to show that we could deliver a clinically relevant amount of PYY into the bloodstream," Doyle says. "We did that, and we are very excited by the results." The next step involves finding ways to insert the B12-PYY system into such things as chewing gum or an oral tablet to create a nutritional supplement to assist individuals in losing weight in much the same way as nicotine-laced gum is used to help people stop smoking. "If we are successful, PYY-laced gum would be a natural way to help people lose weight," he says. "They could eat a balanced meal, then chew a stick of gum. The PYY supplement would begin to kick in about three to four hours later, decreasing their appetite as they approach their next meal."